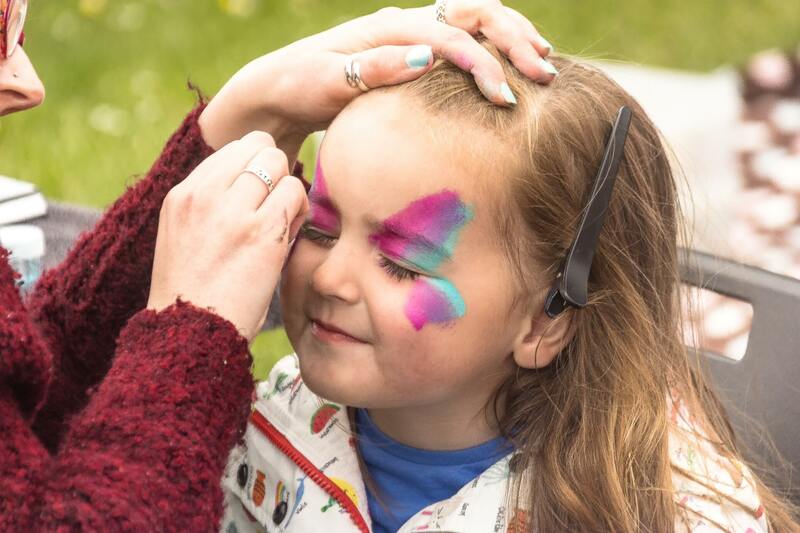 Almost 3,000 villagers came along to Peasedown St John’s 9th Party in the Park Community Festival last Saturday to celebrate the joys of summertime. Sponsored by Michael Gould Property Agents, St John’s Church, Care South, Bath Audi, Gregor Heating, Curo Housing and Peasedown St John Parish Council, crowds enjoyed seven hours of live music and entertainment. The event, which included special guest Richard Wyatt from HTV/ITV News, featured a huge array of stalls and attractions, the village’s first ever Official Push Kart Race, the return of the Peasedown Diamond cider, and the results of the Party in the Park Grant Giveaway. The Sara Holley Community Award, set up in 2011 in memory of a life-long resident who passed away, was won by a man who has spent many years coaching and supporting young people on the football pitch. Paul Sly’s voluntary work with Peasedown Albion Footaball Club only started a few years ago, but once he got stuck in, he couldn’t stop! Over this past 12 months Paul has not only been the manager of Peasedown Albion Football Club’s under 15s team, but he’s also single-handedly got the youngest age-groups flourishing and bursting at the seams with both boys and girls learning how to play football with big smiles on their faces! Almost £3,000 was raised on the day, which contributes to the total £6,000 cost of hosting the one-day event. All of the money will be reinvested back into Peasedown St John either through future events or the Party in the Park Grant Fund. Festival revellers were kept entertained all afternoon thanks to back-to-back outstanding performances, all of which were sponsored by Peasedown St John Parish Council, from DJ Pete Bailey, the Bath Spa Band, Susan Hill School of Dance, Maitree Express, Rubix Groove, Boogie Bounce, Call the Shots and the Rosa Gray Band. To add extra excitement to the proceedings, this year’s Special Guest Host was Pete Helmore from Somer Valley FM, with the radio station broadcasting live throughout the afternoon. Over £2,500 was given away this year to organisations that are either based in, or work in, Peasedown St John. Peasedown St John Methodist Church, Peasedown In Bloom, Wanysdyke Play Association, Peasedown Residents’ Association, Peasedown Wellbeing Group, St John’s Toy Library and Lauren Farm Kindergarten were all presented with grants. Red Post Inn Beer Tent, Centre for Sustainable Energy, Family Crafts, Candles and Home Decorations, Disney Pops Toys, Daisy Bakewell Cakes, Flavoured Hot Dogs, Bedford RL 1957, Crafty Hounds, Plants, Away with the Fairies, Camerton and Peasedown Croquet Club, Penalty Shoot-Out, Hook The Duck, I Scream Tacos, Bouncy Castle, Burger Van, Coffee and Donuts, Cakes From The Soul, Fun Time Leisure (70ft Inflatable Slide, Tea Cups, Tin Can Alley), The Heart Shack, Big Tony Craft (Carved Boxes, Clocks and Coat Racks), Cake and Chocolate, Rainbow Ice Creams, Carved Boxes, Clocks and Coat Racks, Peasedown Social and Well-being Riverford Organic Foods, Coconut Shy and Skittle Alley, Hayley’s Braids and Painted Faces, Bath and North East Somerset Recycling Centre, Sno Bizz Ice Cones, Spudstation and Crazy Cage. Peasedown St John’s Party in the Park festival was held on Saturday 10th June on Beacon Field, from 12noon – 7pm. Thanks to the support of the local Lions Club, Air Cadets and Party in the Park volunteers over 60 hours of time were given to staff the festival gates, and ensure the event ran according to plan, and to schedule.